An experiment in collision detection and avoidance. Basically it just goes forward until its whiskers detect a collision. If the left whisker is activated, then the right wheel reverses for about 0.5 seconds thus turning the robot away from the obstacle and then it continues straight forwards (this also happens with the right whisker/left wheel). - Powered by 4*'C'cells, via 7805 regulator. - Two hacked RC servos providing torque to wheels. - Two NE555N timer chips in monostable mode triggered by the microswitches on the whiskers. - About 15 or 20cm per second. - All circuits built on stripboard. 2 * NE555N timer IC. 4 * 6k8 0.25W 5% resistor. 2 * 47uF (micro farad) 25V Electrolytic Capacitor. 1 * Dual gang 100k Linear Pot. 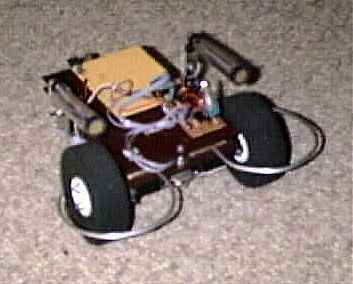 2 * 'Hacked' Radio Controlled servos. many * 200mm cable ties. many * pair of M3 machine screws and nuts. - Can *theoretically* get stuck when approaching a flat object perpendicularly (head on). This does not   tend to happen in real life because of the fact that it very rarely approaches *absolutely* head on. - Whiskers cannot detect objects below and above their line of height.